The novels of Jane Austen (1775?1817) are of remarkable and enduring appeal; popular the world over, they are celebrated for their wit and social observation. This 1932 publication was compiled by George Latimer Apperson (1857?1937), an inspector of schools, editor of The Antiquary from 1899 to 1915, and major contributor to the Oxford English Dictionary. His stated intention for this work was to 'include in one alphabet, the name of every person, place, book and author named in Jane Austen's novels, fragments and juvenilia'. He also extends his coverage to biographical detail, drawing on the landmark study Jane Austen: Her Life and Letters (1913). 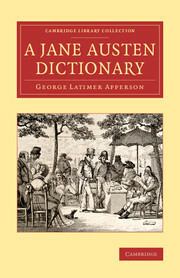 The dictionary was published at a time when Jane Austen scholarship and literary criticism had developed significantly, reflecting the continued public interest in her novels. It remains an indispensable reference tool for all admirers of her work. Prefatory note; References; The dictionary.